Machine learning and more traditional techniques were applied to geochemical data for almost 15,000 stream sediment samples from across a large portion of British Columbia were analysed to more-accurately locate mineral deposits. Publicly-funded regional stream sediment sampling projects are important to mineral exploration companies, governments, and First Nations communities because they provide improved regional geochemical information and help guide decisions about mineral exploration activities. However the mix of sands, clays and gravels collected from a single point in a stream (a “stream sediment sample”) may have travelled a significant distance over a long period of time. Along the way, the sediments may have picked up geochemical signals from many rock types within the catchment basin that might mask any geochemical signals related to mineralization. [See Stream Sediment Geochemistry backgrounder below]. This project separates the ‘background’ chemistry from anomalies that may indicate the presence of mineral deposits. Modern statistical analysis techniques, and multiple techniques run in combination, can more reliably identify the presence of mineralization from steam sediment geochemical data. This new, more robust regional stream sediment geochemical analysis provides reliable data about potential mineral deposits. The Integrated Assessment of Regional Stream Sediment project focused on highly prospective areas of northern BC where geochemical interpretation of stream-sediment data would benefit exploration efforts. Mineral exploration companies and communities are interested in the area’s potential mineral deposits, particularly with recent discoveries and projects advancing in the northwestern BC’s ‘Golden Triangle’. The project analysed previously-collected samples from across northwestern BC in an area that includes communities such as Burns Lake, Dease Lake, Fort St James, Fraser Lake, Kitimat, Smithers and Terrace. The area includes the Golden Triangle and key mineral deposits including Endako, Red Chris, Huckleberry, Brucejack, Mt. Milligan and Kemess. 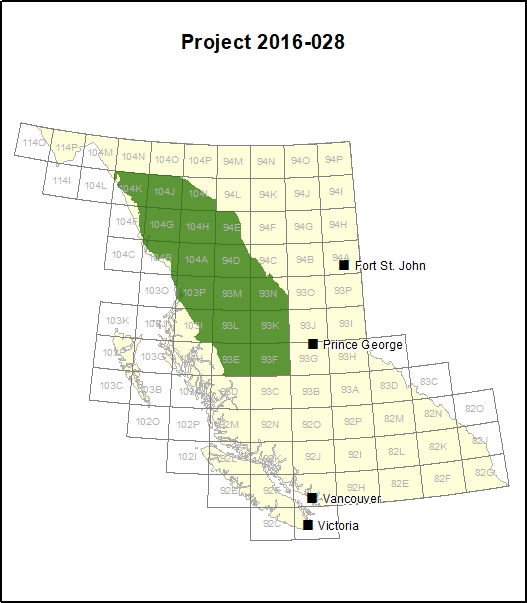 This survey area also adds new data to areas covered by major Geoscience BC projects, including QUEST, QUEST-West, QUEST-Northwest and TREK. No new samples were collected for this project. This project increased the reliability and value of existing data generated by Geoscience BC-funded projects, including GBC Reports 2008-03, 2008-11, 2012-05, 2011-02, 2009-05, 2009-11, 2017-04, and British Columbia Geological Survey report RGS 57 / Geological Survey of Canada report OF 1766. Sand, clay and silts collected from a single point in a stream are a mix of materials from further upstream, including tributaries. Analysing the chemistry of the sediments in a laboratory can indicate the presence of mineral deposits but a more detailed statistical analysis of the data is needed to locate potential deposits.